I swear there’s a new Java update every week, tonight I got so mad at the java icon yelling at me in the system tray on my server that I gave in and clicked it so it would go download the latest ultra-important POS updates that are Java. What am I greeted with? 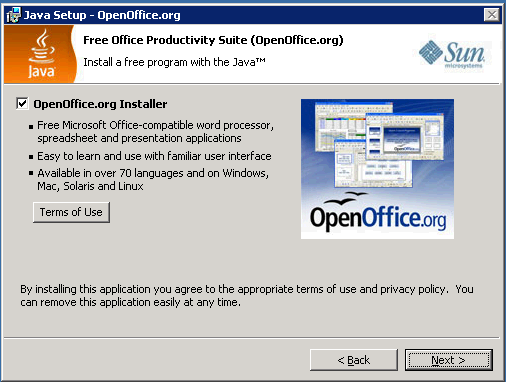 I’ve blogged about the JRE wanting to install Google Desktop before, but an entire Office Suite!?! Give me a break! Good thing we don’t allow users to install their own software, or this might get installed on every machine in the company.